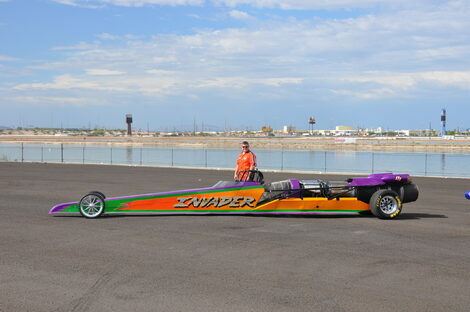 Curt Eierdam is the driver of the “INVADER” an awesome Fire breathing, 300 mph Jet Dragster. 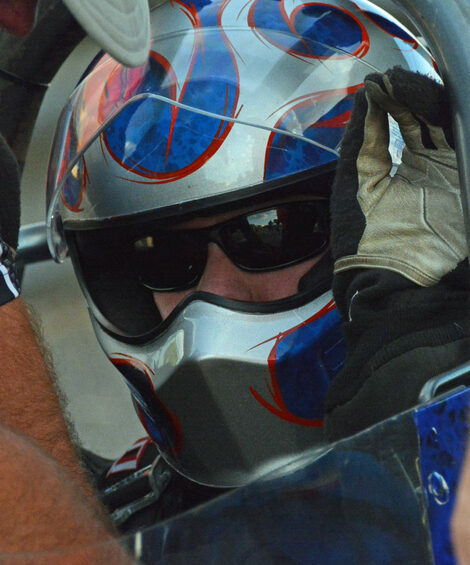 Prior to assuming the driving duties, Curt has been the crew chief of the Invader Jet Dragster while his father Al Eierdam (driver of Jet Cars for 30+ years) performed all over the United States, Canada, and Mexico. Curt started off his involvement with jet cars in 1976 helping with the cleaning and up keep of the Emergency 1 Jet Dragster. By the time the first Invader Jet Dragster rolled out in 1980, he was able to perform all the maintenance on the jet dragster alongside his father Al. In 1985, Curt took over crew chief duties for the team. As Al took on driving of different cars, Curt went along as the crew. He was a crew member of the “Vanishing Point” Rocket Funny Car, “Air Supply, the fastest Air powered Thrust driven vehicle”, the “Simple Pleasure” Jet Dragster, and the “Fireworks USA” Jet Funny Car. Curt and Al also helped with the restoration of the “Hustler” World Record Holding J-46 Jet Powered boat for the Legendary Jim Deist of Deist Safety Equipment fame. Curt also assisted various jet teams with training of the operation of jet vehicles, maintenance, and crew training across the U.S. He has traveled thru-out Mexico, Canada and Europe to instruct and repair various jet vehicles. During the break of running a team, Curt found time to earn his FAA Airframe & Power Plant (A&P) license and hold a three level certification in eddy current, ultrasonic, radiography, magnetic particle and liquid penetrant inspection methods while working for various aerospace industries companies such as Lockheed, Falcon Aviation, and DeVelco. In addition to the call of the drag strip, Curt also heard the call to duty. He is currently a full time employee of the Arizona Air National Guard as a Maintenance Scheduler. Curt has spent his twenty plus years in the areas of Jet Propulsion, Non-Destructive Inspection, and Metals Fabrication. Guam and Italy over the last several years. He is 47 years old, married with 3 children and lives in a suburb of Phoenix, Arizona. 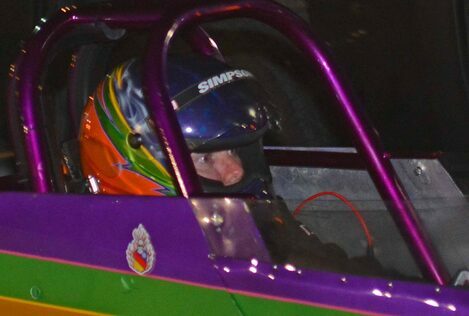 When he is not racing he is involved with various community organizations, Girl Scouts and Cub Scouts. 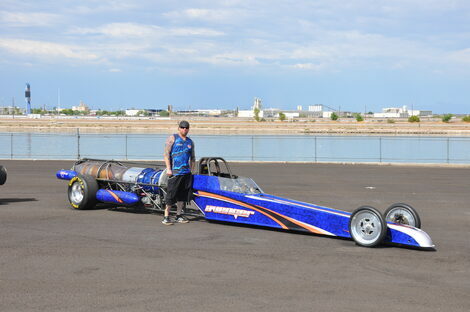 Craig Eierdam is the driver of the “AVENGER” Jet Dragster, the newest of JET FX dragsters. Growing up in a jet car family, Craig has learned how to handle all the logistics and operations of a touring professional race team. From the media relations and scheduling, to the maintenance and building of the jet turbine engines, Craig is proficient in various aspects including fuel systems, afterburner, support, and life safety equipment to ensure a safe and entertaining run. When Craig is not lighting up the desert sky, he is working for Union Pacific railroad as a conductor, and is a certified Firefighter and EMT, with training in Hazardous Materials and Technical Rescue. In his off time he is an avid snow and wake boarder. He also enjoys skydiving, classic car restoration, traveling and spending time with family and friends.